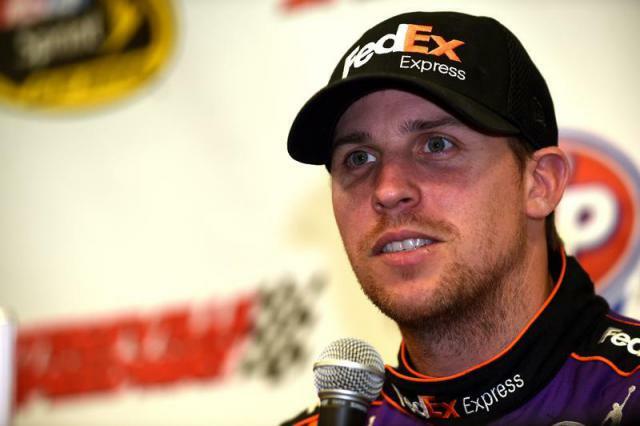 Early Sunday evening at Martinsville Speedway, Denny Hamlin held off last week’s NASCAR Sprint Cup Series (NSCS) race winner, Brad Keselowski – by 0.186 seconds – to win the STP 500. Following Hamlin and Keselowski to the drop of the checkered flag were pol-sitter Joey Logano finishing third, Matt Kenseth fourth and David Ragan finished fifth. Rounding out the top-10 finishing positions were Martin Truex Jr. bringing home sixth, Danica Patrick seventh, the current series points leader, Kevin Harvick eighth, Jeff Gordon ninth and Jamie McMurray claiming the 10th position. With his eighth-place finish, Harvick leaves Martinsville with a 24-point lead over Joey Logano. Time of Race: 03 Hrs, 49 Mins, 13 Secs. Next Up: The series takes this coming Easter weekend off, and returns to action the following week on Saturday, April 11th, with the Duck Commander 500 at Texas Motor Speedway. The race is scheduled to get under way around 7:50 p.m. (ET) that evening, and television coverage of the event will be provided by FOX. Sebastian Vettel scored his and Ferrari’s first win since 2013 on Sunday, as a superb drive for his new team took him to victory in the 2015 Formula 1 Petronas Malaysia Grand Prix. Vettel moved into an early lead when his rivals pitted under the safety car, and then never looked back, using a two-stop strategy to beat the three-stopping Mercedes of polesitter Lewis Hamilton and team mate Nico Rosberg. Behind the fleet German – who poignantly lapped both Red Bulls four laps from home – polesitter Lewis Hamilton maintained his championship lead but struggled with his Mercedes’ balance on his way to a frustrated second place, 8.5s in arrears and 3.7s ahead of team mate Nico Rosberg. Hamilton had led away but things went awry for Mercedes when Marcus Ericsson spun his Sauber at Turn 1 on the fourth lap, bringing out the safety car. Hamilton and Rosberg both immediately pitted for Pirelli’s hard tyre, but crucially Ferrari kept Vettel out on the mediums on which all of the top 10 qualifiers had started. As Mercedes thus locked themselves early into a three-stop race, Vettel was able to make use of his Ferrari’s lower tyre degradation to control things and get by with only two stops. Mercedes were thus left on their back foot. Underlining how strong the red cars were in the very high ambient and track temperatures here, Kimi Rakkonen recovered from a first-lap puncture after a brush with Felipe Nasr, and then two normal pit stops, to take fourth, well ahead of a tense intra-team battle which saw Valtteri Bottas come back from a first-lap clash with Pastor Maldonado to push ahead of Williams team mate Felipe Massa on the 55th of the 56 laps. Max Verstappen was always in contention for points, and duly took a great seventh place, making him, at 17, the youngest driver ever to score world championship points. He was the last unlapped runner. Making it a grand day for Toro Rosso, team mate Carlos Sainz followed him home in eighth. It was a bleak day for Red Bull; Daniil Kvyat survived an attack which saw Force India’s Nico Hulkenberg spin him at Turn 2 to take a lowly ninth after a tough battle with team mate Daniel Ricciardo, whose own RB11 suffered front wing damage on the opening lap. Lotus’s Romain Grosjean was spun by Force India’s Sergio Perez during an overtake attempt midway through the race, but recovered for 11th ahead of a troubled Felipe Nasr who struggled all afternoon with his Sauber and never looked like repeating his brilliant Australian debut. Perez eventually led Hulkenberg home by just four-tenths of a second, both Force India drivers having been given 10-second penalties for their indiscretions. Roberto Merhi was the final finisher for Marussia, three laps down, after team mate Will Stevens was unable to start as his car could not be repaired after his fuel system problems on Saturday. Jenson Button’s McLaren suffered power loss just when – to his surprise – he found himself catching cars in front, while Fernando Alonso’s sister car also experienced a technical problem. Ericsson could not restart after his spin, so was the race’s first retirement. Vettel’s victory – the first for Ferrari since the 2013 Spanish Grand Prix, and the German’s first since Brazil in the same year – allowed him to close to within three points of Hamilton in the drivers’ standings. After two rounds Hamilton has 43 points to Vettel’s 40 and Rosberg’s 33. After a green-white-checkered (flags) dash to the finish, pole-sitter Joey Logano on Saturday, held off the reigning NASCAR Camping World Truck Series (NCWTS) champion, Matt Crafton – by 0.431 seconds – to win the Kroger 250 at Martinsville Speedway. Logano, who led the most laps – 150 out of 258, received his first series career victory and gave Brad Keselowski Racing their second victory of the season. And with his victory, Logano also became the 26th driver to win a race in all three of NASCAR’s national series. Following Logano and Crafton to the drop of the checkered flag were series Rookie of the Year (ROTY) contender, Erik Jones finishing third, Johnny Sauter fourth and Tyler Reddick finished fifth. Rounding out the top-10 finishing positions were Daniel Suarez claiming sixth, James Buescher seventh, John Wes Townley eighth, Matt Tifft ninth and ROTY contender Justin Boston bringing home 10th-place. With his second-place finish, Matt Crafton leaves Martinsville with a two-point lead over Tyler Reddick. Time of Race: 01 Hrs, 59 Mins, 22 Secs. Next Up: The series takes the month of April off and returns to action on May 8th at Kansas Speedway (Kansas 250 – no entitlement sponsor at this time), with an approximate starting time of 8:50 pm (ET – On FOX Sports 1). 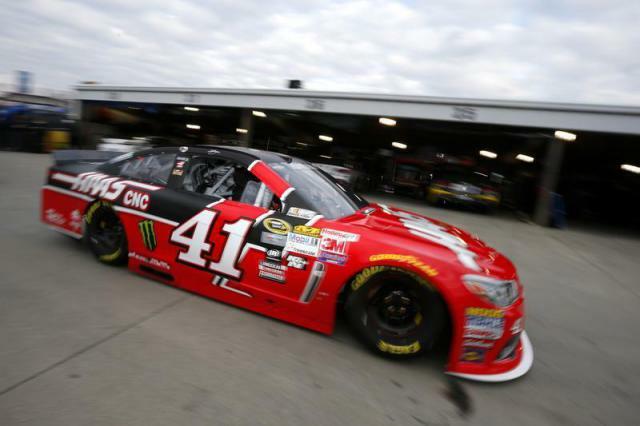 During the final NASCAR Sprint Cup Series (NSCS) practice session for Sunday’s STP 500 at Martinsville Speedway, it was Kurt Busch – with a lap speed of 97.098 MPH – posting the fastest lap of the session. Jimmie Johnson, with a lap speed of 96.810 MPH, was second fastest and was followed by Jeff Gordon (96.726 MPH) who was third, Denny Hamlin (96.652) fourth and Ryan Newman (96.598) was fifth. Rounding out the top-10 fastest drivers in the “Happy Hour” (final) practice were Kasey Kahne (96.568) who was sixth, Sunday’s pole-sitter, Joey Logano (96.460) seventh, Kevin Harvick (96.455) eighth, Carl Edwards (96.450) ninth and Greg Biffle (96.371) posting the 10th fastest lap speed. 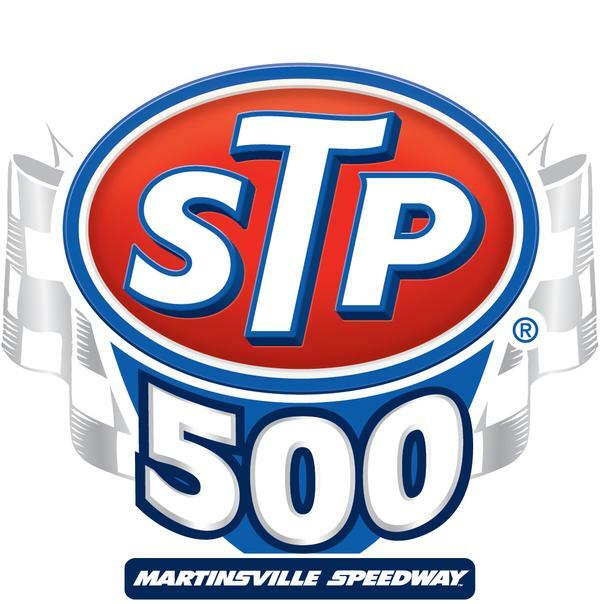 The 66th annual STP 500 is scheduled to get underway around 1:20 p.m. (ET) Sunday afternoon, and FOX Sports 1 will provide television coverage of the event. Denny Hamlin, with a lap speed of 97.113 MPH, was the quickest Saturday morning during the second NASCAR Sprint Cup Series (NSCS) STP 500 practice session at Martinsville Speedway. Second quickest with a lap speed of 96.988 MPH was Jimmie Johnson, and he was followed by fellow Hendrick Motorsports teammates, Jeff Gordon (96.884 MPH) and Kasey Kahne (96.815) who were third and fourth quickest respectively, and Carl Edwards (96.711) was fifth. Rounding out the top-10 quickest drivers in the session were Paul Menard (96.701 MPH) who was sixth, Ryan Newman (96.681) seventh, Kyle Larson (96.622) eighth, Martin Truex Jr. (96.612) ninth and the current series points leader, Kevin Harvick (96.519) posting the 10th quickest lap speed. Final (“Happy Hour”) practice for Sunday’s race will be this afternoon from 1:00 p.m. – 1:50 p.m (ET – On FOX Sports 2). Lewis Hamilton claimed his and Mercedes’ second pole of the season after denying Ferrari’s Sebastian Vettel in a dramatic and rain-hit qualifying session in Malaysia on Saturday evening. A massive downpour hit mid-way through Q2, causing several delays to the final shootout for pole. When it did get underway, Hamilton hit the front immediately with an imperious lap that would ultimately prove enough to secure pole. It was mightily close however, as Vettel improved at the close to get within 0.074s of the lead Silver Arrows. His gain was Nico Rosberg’s loss: the German was unable to improve on his own flyer and had to settle for third, alongside Red Bull’s Daniel Ricciardo. The Australian’s team mate Daniil Kvyat was fifth, and will therefore share the third row of the grid with Toro Rosso’s teenage rookie Max Verstappen.